As the summer progresses through August there is a lot going on in District 7475. I have had the privilege of visiting with 22 clubs to date and hope to finish the month with another dozen or so visits. I am very pleased that the Princeton and Princeton Corridor Clubs have scheduled a joint meeting for me to visit them in October. Right now, I am scheduled out through January with club visits. During the meetings I have met Rotarians of all ages who are committed to club membership growth, supporting their communities through service, and enhancing the public image of Rotary. Club presidents are implementing their plans and leading their clubs. The energy is impressive, and the potential is very strong. By the time you read this Camp Merry Heart Day will be completed (August 8th) and Rotarians from throughout District 7475 will have journeyed to Great Meadows, N.J. to conduct games and a barbecue for the campers at this Easter Seals' camp. This is a Rotary tradition dating back many years and was under the skillful leadership of PDG Larry Ripley of the Morris Plains Rotary Club. We all owe a special thank you to Larry for orchestrating this service day at the camp. I know that some clubs will have been involved locally in the National Night Out on August 7th that supports community policing and the citizens of the towns. Other clubs are working on activities like the Sussex County Farm & Horse Show as well as planning participation in street fairs and at least one town carnival. Others are beginning drives for back to school needs for children like book bags and school supplies. This year it is very important for club presidents and/or secretaries to go on Rotary Club Central and report your service activities. Rotary is looking to aggregate those numbers and it all begins by reporting at the club level. After Labor Day the District Rotary Foundation Committee will be playing host to a Foundation Seminar at the Pines Manor in Edison on September 8th. See the website to register and send your check for the event to Michael Townley. Likewise, the West Orange Rotary Club is promoting its 90th Anniversary event on October 20th as a chance to hear from RI President Barry Rassin and to help raise significant dollars for Polio. If you plan to attend, please register early. 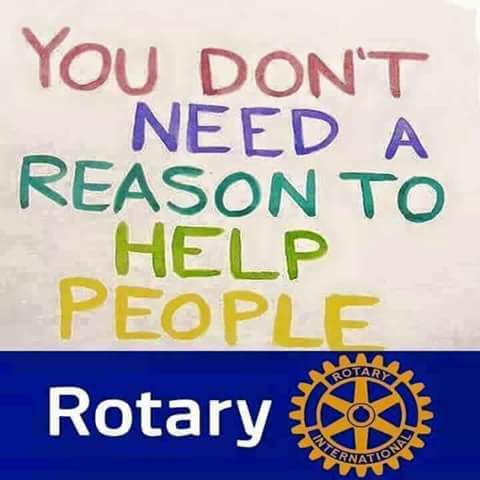 If you plan to contribute, please do that early also so the proper recognition can be processed through The Rotary Foundation well in advance of the event. I leave you with one sad note. Back in July we suffered the loss of Past District Governor Karien Ziegler. She had a serious health challenge this year that ended in July. Karien was District 7470 "Polio Champion" throughout the campaign and did an incredible job for garnering support for polio eradication. It is only fitting that the West Orange Rotary Club has taken on the polio challenge since Karien had been a valued member there for many, many years. MAY SHE REST IN PEACE.